I am quickly understanding that the other thing about this is that you still have to mow it even if your lawn is not as green as your neigbours and frequently it seems. 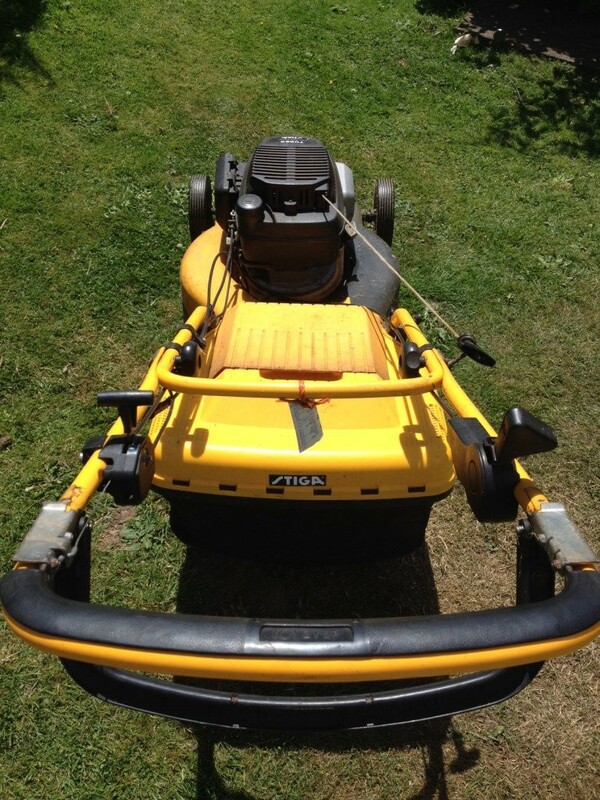 My next purchase which was critical due to the length of the grass in my garden was a lawnmower this week. 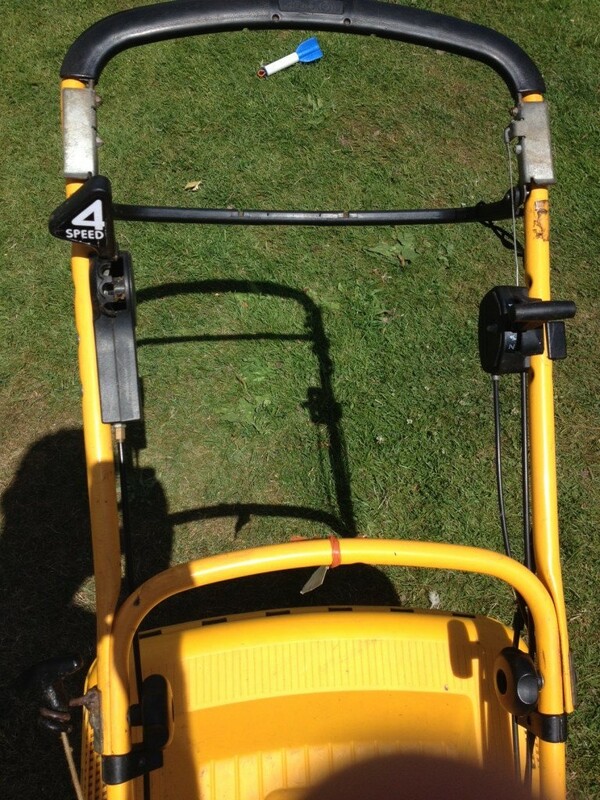 So armed with my new purchase I set about attacking the long grass in my garden, even though it was long, this fine beautiful machine took to it with ease and I had soon cleared a large patch. However that was the easiest part of the job, I then attempted to cut an area on one of the slopes, there are several large areas of very steep lawn by the way and due to the length of grass and the incline this was much harder work. Also because it was really long, the grass wasn’t collecting so it did involve a lot of raking! I forgot to say that I also purchased a rake (the range of tools is quickly expanding) even with my limited gardening nous I thought ahead and realised I would need a rake, I picked one of the ones with long spikes in a fan shape rather than just a straight one, why, well because it looked nicer. Luckily I discovered later when reading about grass cutting that the other one was for raking soil phew! The final part of this post is a brilliant discovery I made in one of the old sheds at the bottom of the garden. 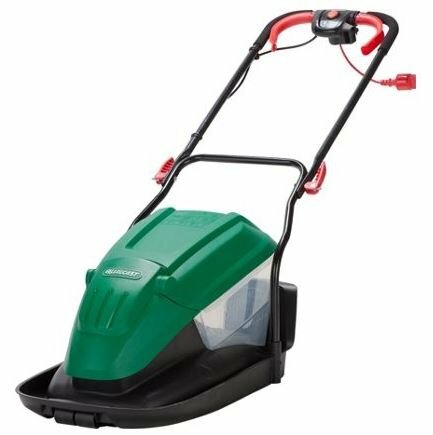 I found an old petrol lawnmower which after searching online it is a Turbo Power 53 SB 53cm Self-Propelled Lawnmower. After filling it with petrol, cleaning it and about half an hour of trying to start it, the engine kicked into life. It is a little temperamental and stall frequently however it was perfect to use on the flat right at the bottom of the garden where there is no electricity. I did have a go on the steep hills but the self propulsion didn’t work and to get up the hill with this heavy beast I had to sprint up so was hard work. It even has 4 gears! Any tips on maintaining a lawn? Cut grass only when dry. Cut to medium length. Leave for two days. Then cut again at short length. Do not use anti-moss/weed lawn seeds. Get on your hands and knees and pull them out. Petrol mowers are the only way to go! Don’t forget to compost the cuttings! Thanks for the tips Lindsay! Thanks Kevin, don’t worry I am planning a couple of spots for composting will be happening shortly! Have you considered 3G AstroTurf?? Keeps its looks all year round.